Yep, I’m celebrating my second, that’s right, second cold of the season. I’m stuffed up, achy and just don’t feel good. My immune system has to be that of an ant. Actually, maybe they have a better one. This cold has taught me I have to take vitamins because God knows I probably don’t eat right at all. I thought my exercise regiment would actually help boost my immunity but apparently not. I’ve always been prone to getting sinus infections, which I think this actually is. But I hate feeling this way. I’ve probably tried, at one point in my life, every cold medicine shown in the picture and nothing really works. You simply have to give the bug time to get out of your system. Everyone says try Zicam®, so I’ve been suffering with the downright horrible chalky taste of their quick dissolving tablets. My result, still got a cold and it doesn’t seem to be going away any faster. Others say try Alka-Seltzer Plus® Cold Medicine. I did during my last cold or sinus infection, whatever it was and nadda, suffered with the dang thing for three weeks. 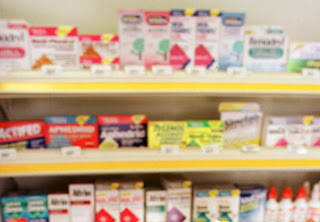 Even Alka-Seltzer says it rushes medicine to break up your worst cold symptoms fast. Sorry, that wasn’t the case, in my case. Now, does any of this have to do with the stress of my job or of the recent events in my life, most definately! So, I’ll self-medicate myself (sic) and try to battle this dang virus myself because going to the doctor always ends with antibiotics and everyone says antibiotics don’t treat colds. Clarinex-D® 12 Hour is, however, my friend. I have a prescription for it and it actually helps me when I get all stuffed up. So here’s my arsenal of medicine this time around, I’ve got the Dayquil, Zicam, Clarinex-D, and Alka-Selzer Plus Cold Medicine (all the implied ®’s for each of them) in the cabinet ready to roll if I need them, oh and I have the Vitamin C, which I’ve been popping at a crazy rate. I’ll take any prayers too! My advice to you, wash your hands a lot!